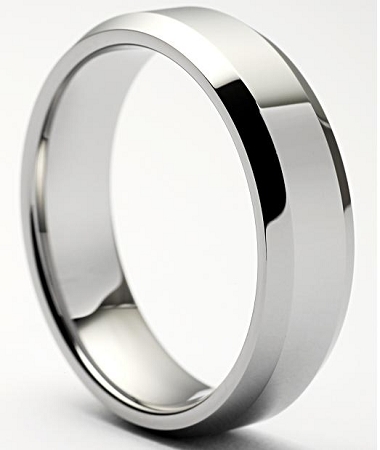 Fantastic simple 8mm highly polished beveled tungsten ring. This Nicollo 8mm beveled tungsten ring also comes in a 4mm, 7mm and 10mm. Was this answer helpful? 11 of 12 Customer(s) found this Answer helpful. Q: Is there any way I can see what the regular font and script font looks like before I choose? The ring is A bit gun metal colored but not noticeable--I would've preferred it to be more white gold/silver looking but my fiance seems to love the color! Customer service was amazing. I did my research everywhere and finally decided to purchase from here. Not only was this affordable but it comes with all the life time warranties as a well (primary reason for me to purchase)! You guys should get more ethnic or religious neutral designs so we can have more of a variety to choose from. The ring I purchased was wonderful. This ring is of the highest quality and fits perfectly. I am absolutely satisfied with my purchase. Great looking ring, great price, and very stylish. Purchased the ring to be a wedding band. It surpassed my expectations so I'm ordering the matching woman's band for myself. Great quality and reasonably priced. Ring is great! Fits perfectly on my husband and can stand up to his working daily with scrap metals and how rough he is with his hands. Absolutely great ring. Just as advertised, VERY comfortable, masculine looking and price point was good. I was so pleased I called by phone the day after receiving it to let the staff know. Company is easy to work with and it arrived quicker than I thought it would. Kudos! This ring is amazing for the price!! We ordered this ring after I had put the same one in layaway at a regular jewelry store for $300 after realizing I can get same one for $40!! When we received it it was as good as it sounded!! Quality is great and fit perfect!! My fiancé loves it!! We will order in future!! Absolutely beautiful ring! I was on a pretty tight budget and this was perfect! I ordered this ring as a back up for my wedding band which gets banged up as a contractor. I now have an excellent ring at a great price for events or nights out. Highly recommend! My husband lost his wedding band and I gave him this ring as a gift. It came quickly, great quality, great fit and great looking. I am going to order the woman's version for myself. Love Tungsten Carbide rings from Tungsten Fashions! My latest purchase from Tungsten Fashions was my third ring purchase from them and my first with engraving. I love the hardness of the Tungsten Carbide, as my rings never get scratched up and always keep their sheen. The engraving on this latest ring was well-executed and crisp and is something I will cherish forever. The delivery and customer service from Tungsten Fashions is top-notch, and you can't beat the prices. I'll be back for more, for sure. I have to admit that I was a bit skeptical when I was introduced to this site, but totally impressed by the appearance, and speed of delivery, and especially the "price point". I've already recommended it to several friends that were in the market for wedding rings. Great finish and correct size. Shipping was expedious and timely. Would purchase again. I absolutely love the ring! It is everything you said it was and the brilliance of it after rough use remains! Would highly recommend it to anyone! Great quality! Fits perfectly without any adjustments and the color looks great as well! I'm absolutely satisfied with this ring, just what I've been looking for something simple with high quality.